The Truth About Islam Project has been running since November 2002. It is aimed at both Muslims and Non-Muslims and has been set up to promote a true understanding of Islam in times of miscommunication and misinformation. 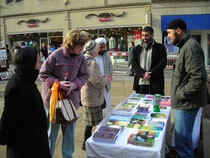 Taip not only distributes free written information on Islam but also provides volunteers in order to promote dialogue. Our Taip teams Alhamdulillah have been involved both directly and indirectly with administering numerous shahadahs both on and off our weekly da’wah information stands held in the Center of Sheffield, Rotherham and Leeds.